There are hundreds of different home security cameras on Amazon and plenty of them are great options. There’s one in particular that we have our eye on today though, because it’s on sale at an unmissable price right now. 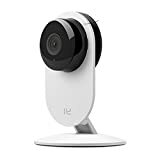 The wildly popular YI Home Camera is just $20 on Amazon right now if you buy two and use the coupon code 49HH9WAG at checkout. You’ll have to add two to your cart manually and then apply the coupon code, and then you’re all set. Toss in a $35 YI Dome Camera that you can pan and tilt remotely using the accompanying app and you’re good to go. No monthly subscription fees: Secure your videos on a micro SD card, own your video content and access video history anytime. Supports upto 32GB SD micro SD cards with FAT32 format.